Tbilisi is stiflingly hot in July, it seemed like a good time to head to the cooler mountainous regions of Georgia. This trip was taken over two days with “აბოდიალებულები” (which roughly translates as “the wanderers”) in a Mercedes Sprinter driven by Nika. We met at Marjanshvili for an early 7.10pm start (true to form this was later than the scheduled 6.30pm). Racha is a highland area in Western Georgia. Our first stop was by the scenic Shaori Reservoir. It would be even more scenic if previous visitors hadn’t left their litter. Ana and Khato by the Shaori Reservoir. 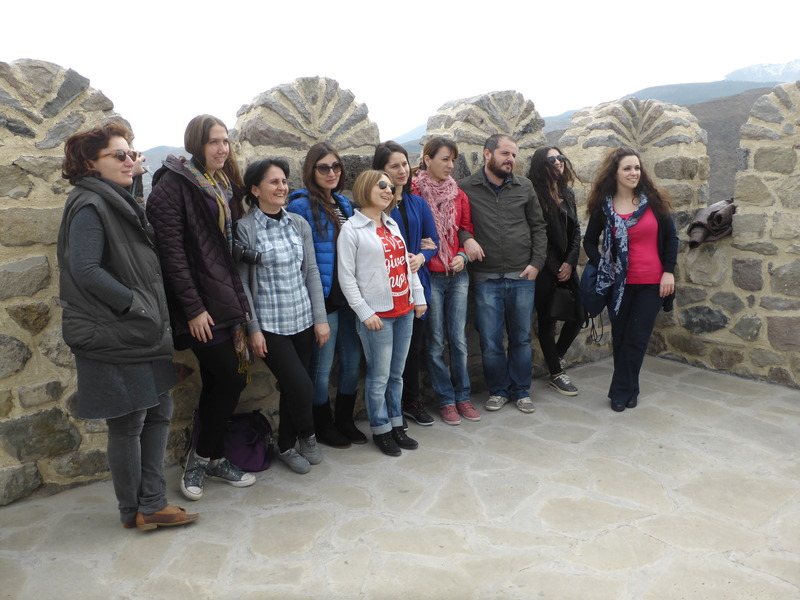 After a short pause by the water, it was back in the minibus to visit Nikortsminda Cathedral, originally built in the reign of Bagrat III in the 11th Century, the inner walls are painted with frescoes dating back to the 16th and 17th centuries. Continuing the religious theme we went on to visit the ruins of the monastery complex at Chelishi, which involved a short walk along a very muddy path. After the monastery we ventured to the source of the Sharaula River. This path involved negotiating some piping; Khato had no problems with this, I managed okay (although I was fearful my legs might start shaking, like on my third failed driving test) but some of our party needed a helping hand. After the source of the Sharaula, it was time to find an ice cave, which was cool in both sense of the word. We finished the day with a dip in the reservoir for the brave. Then made our way to a guest house in Ambrolauri for the obligatory Georgian supra (feast). I left the supra at 11pm, but many of the Georgians more conditioned to such feasting, continued toasting each other, eating and drinking until 3am. 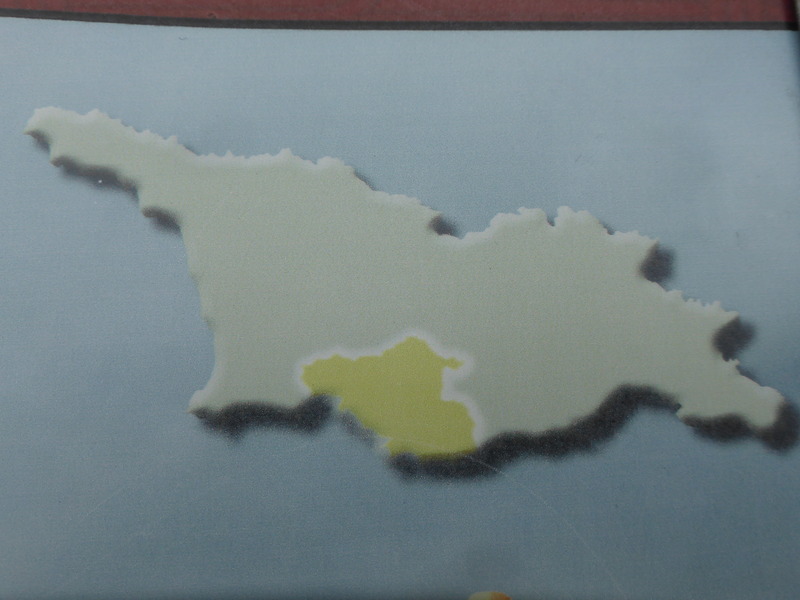 a region in the South of Georgia bordering Turkey, three hours from Tbilisi. We went with my wife’s Police Academy colleagues. 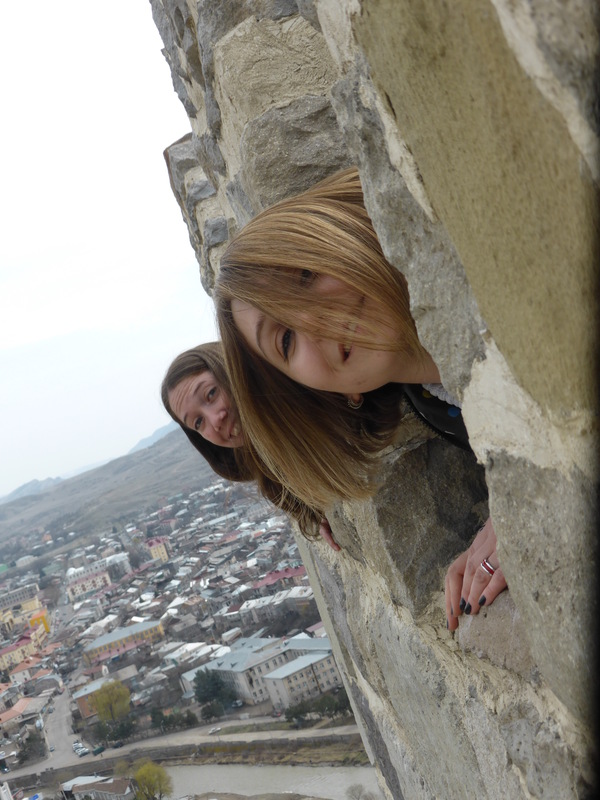 We got up really early (5.45am), we had been told to meet the minibus at 7.30am at Didube in Tbilisi. With true Georgian timing the minibus didn’t actually leave until 8.15am. 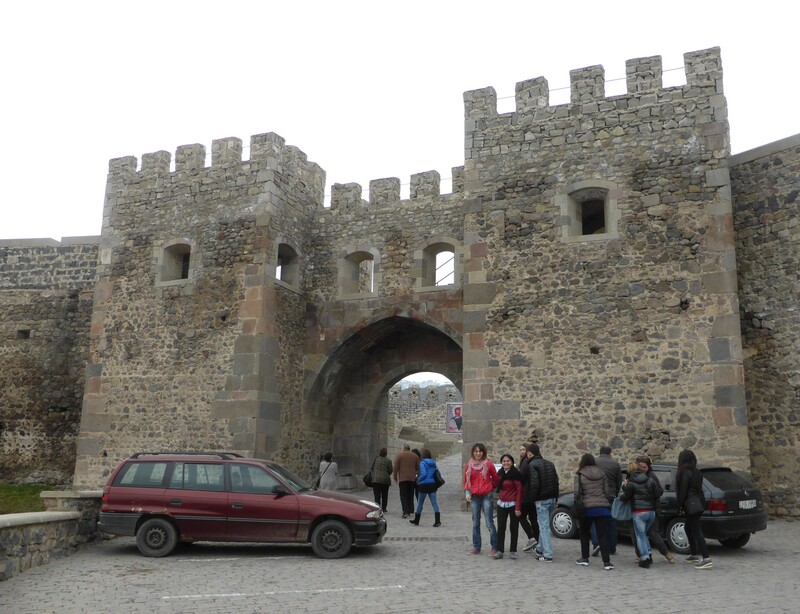 Our first stop, not counting a rest stop, was at the castle in Akhaltsikhe (literally New Castle). The castle dating from the 12th Century is a mix of styles and might be described as a Georgian Alhambra, having a Mosque and many Islamic elements. The mosque was built by Haji Ahmed-Pasha Jaqeli. The town has a reputation for tolerance in addition to Orthodox Churches and the Mosque, there is also a synagogue, an Armenian church and a Catholic church. There is an interesting museum Ivane Javakhishvili Samtskhe-Javakheti History Museum on the site partly funded by BP, a company which uncovered many interesting artefacts when building their pipelines through Georgia. Unfortunately no photography is allowed inside the museum, which contains a large collection of pottery, manuscripts, arrow heads, clothing and carpets. After the castle we took the road that follows the upper Mtkvari river through some spectacular scenery to Vardzia. 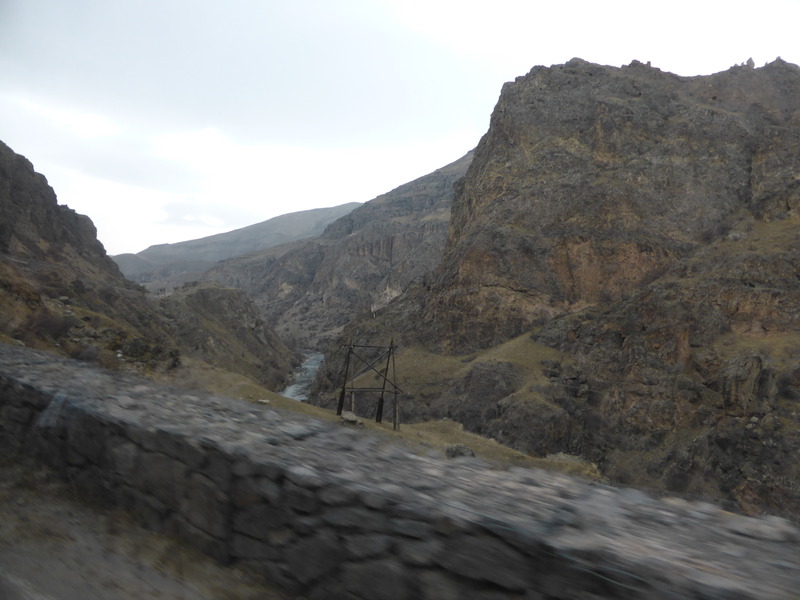 The road to Vardzia following the Upper Mtkvari river valley. 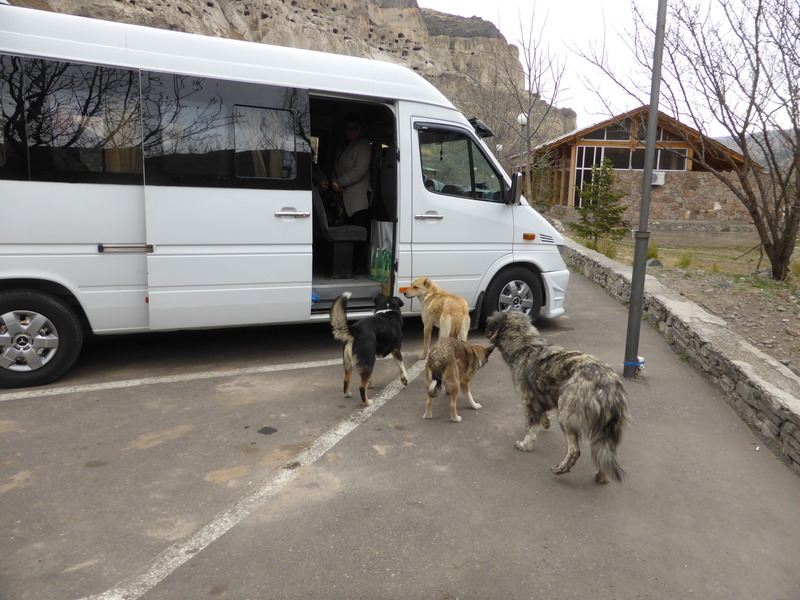 At Vardzia we had a welcoming committee of 4 dogs, they were friendly employing their soulful eyes to extract some tasty titbits from tourist parties. 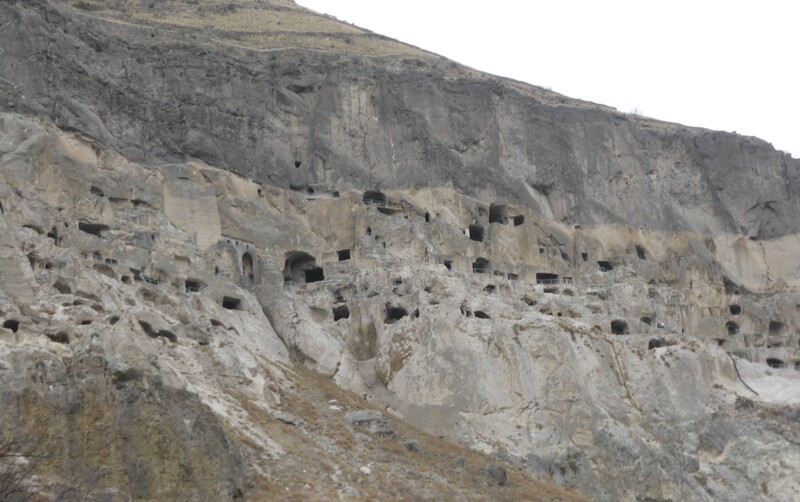 The cave city of Vardzia was the highlight of the trip, during Tamar Mepe’s reign (1184-1213) the city was inhabited by as many as 2000 monks with 409 rooms carved out of the rock. A massive earthquake in 1283 shook away the outer walls of many caves. This cave was the pharmacy with shelves carved into the cave wall. 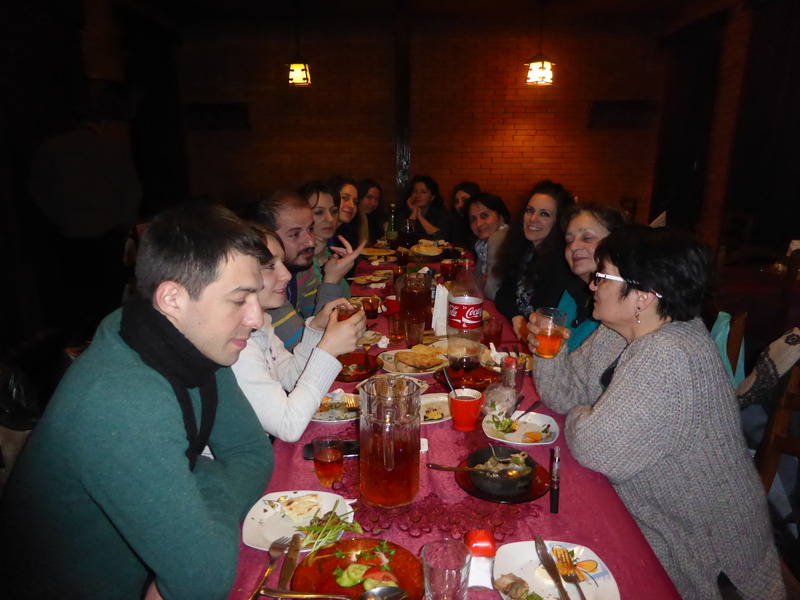 On our way back to Tbilisi, we stopped at a roadside restaurant to feast with a Georgian “supra” (literally “table” but applied to Georgian style feasts with plenty of food, wine and toasts). 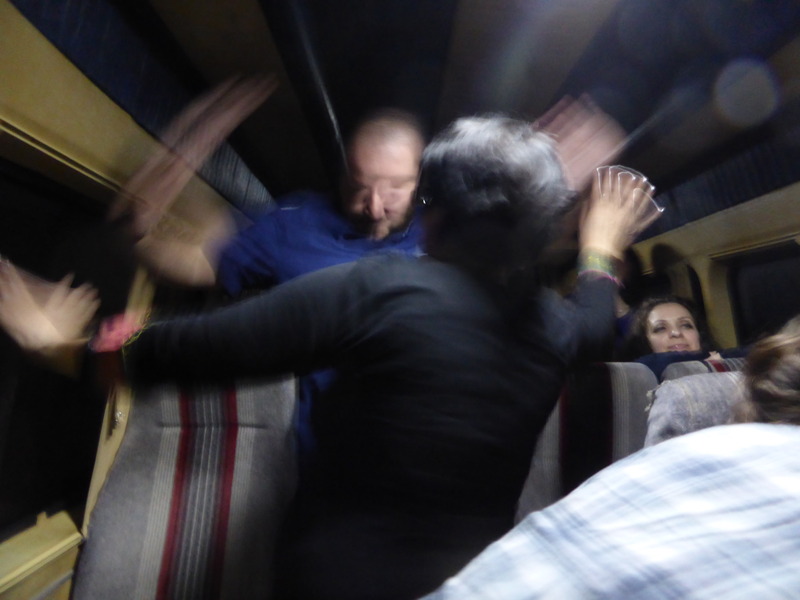 Maybe there was a little much wine at the supra, some of the party were dancing in the minibus on the way home. ქრისტე აღსდგა! 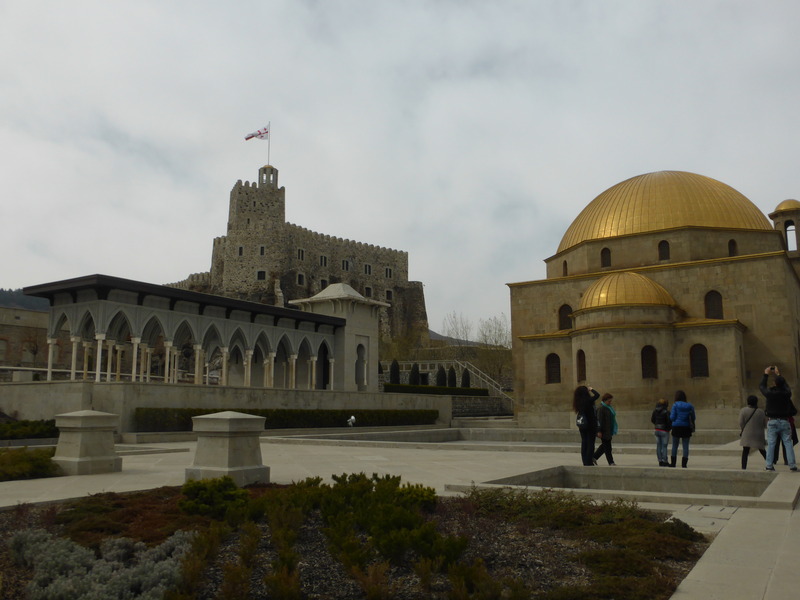 Christ is risen! 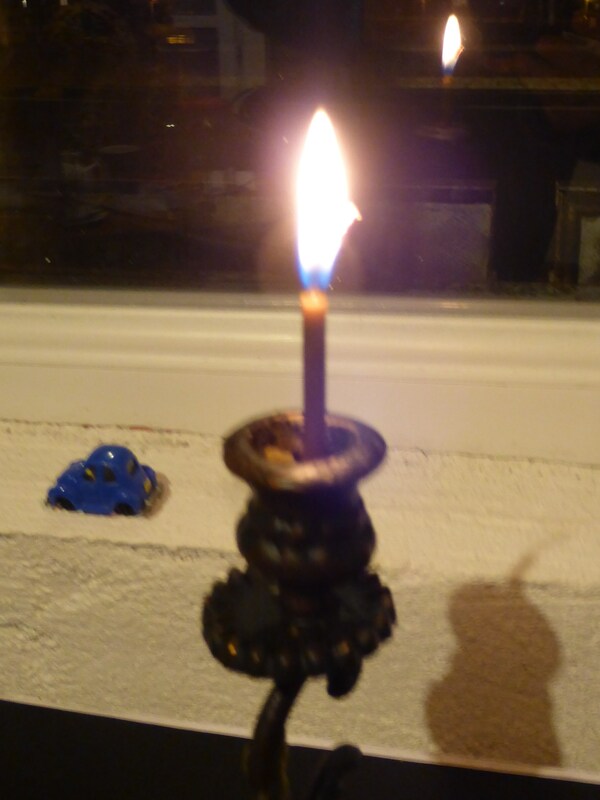 Easter is the most important date of the Christian Calendar. 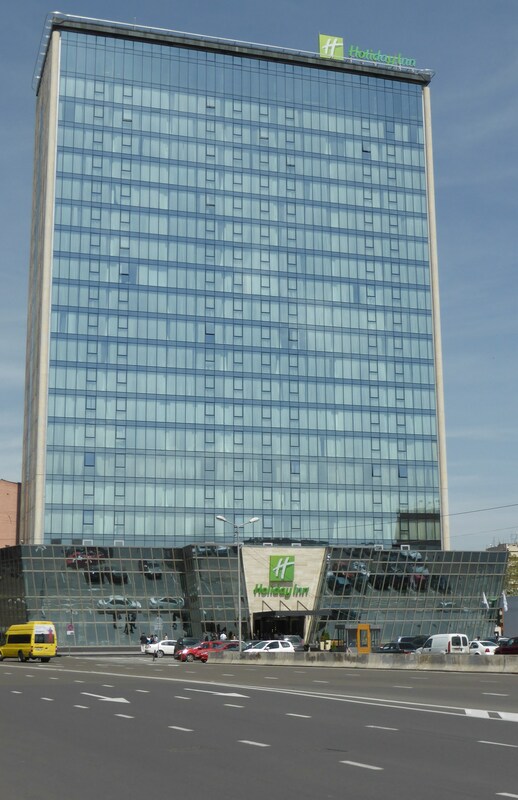 I started the day attending a service of the Tbilisi International Christian Fellowship held at the Holiday Inn in Saburtalo, Tbilisi. The congregation comprised of many nationalities including 29 Koreans, Russians, Chinese, Georgians, Dutch, South African, German, Azeri, Indian and Brazilian. Part of the service included a living tableau. 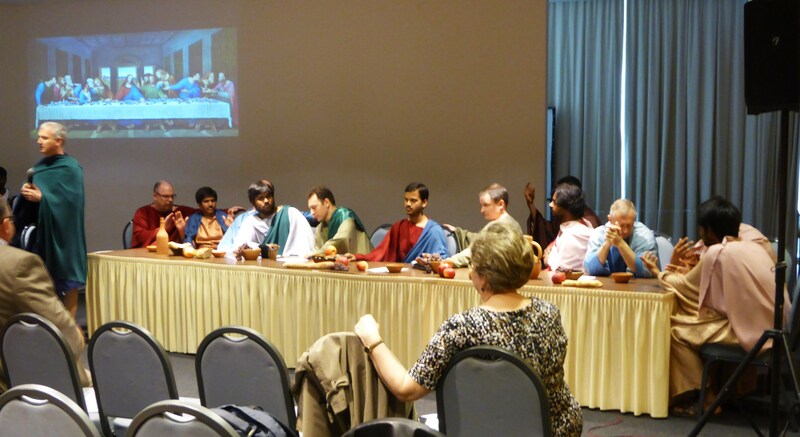 DaVinci’s painting of the Last Supper was recreated by thirteen men from the cosmopolitan congregation. The disciples, having learnt one would betray the master from among them, address the congregation,each in turn, asking if they are to be the traitor. 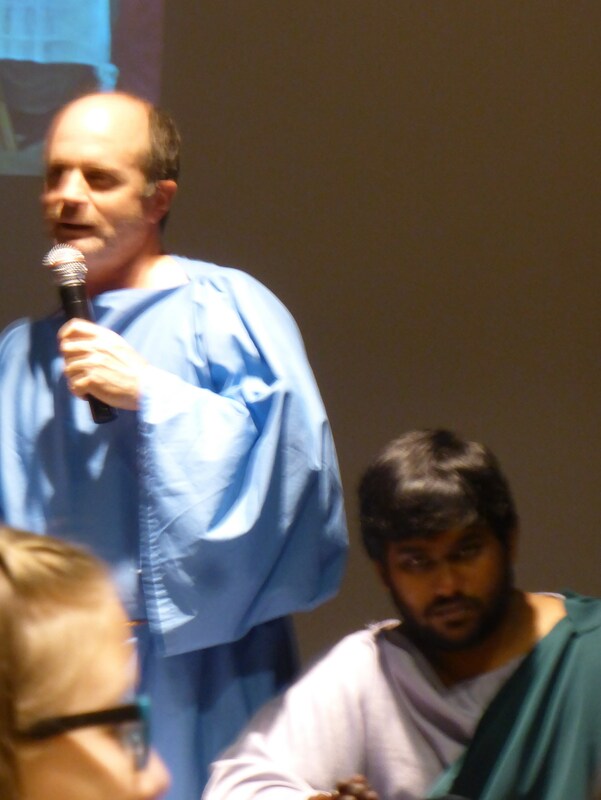 Peter speaks while Judas Iscariot awaits his turn. After the service I met with my wife, her sister and her brother-in-law and we went to visit the grave of her father and uncle.It is an Easter tradition in Georgia to visit the graves on Easter day or Easter Monday. 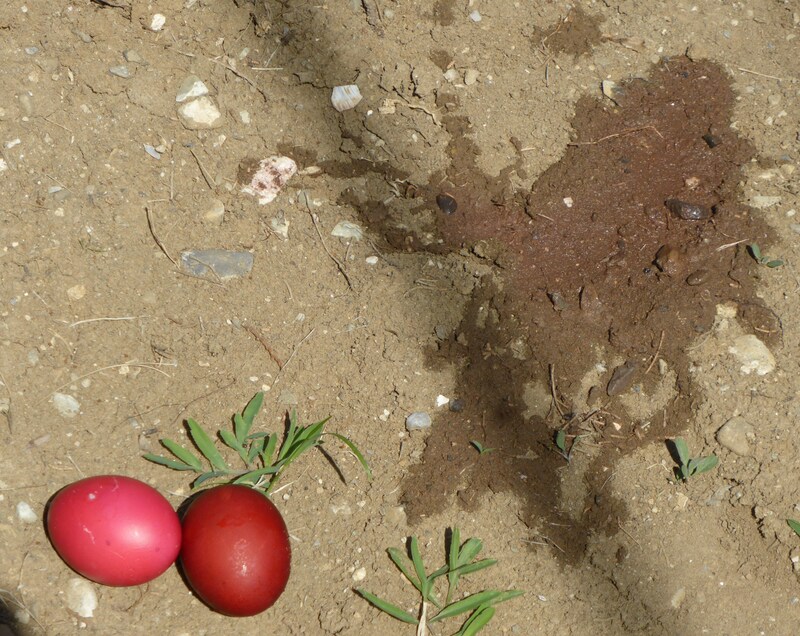 At the graveside a few words are said some wine is drunk and red eggs are left on the grave and wine is spilt on the grave, so the dead are remembered as part of the celebration. After, we leave the graves for a big Easter “Supra” (feast) with Khato’s cousins. 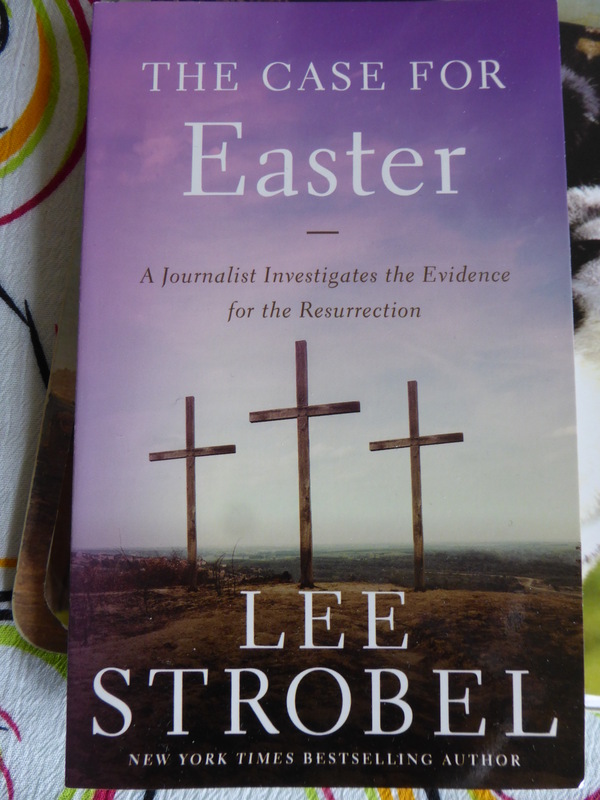 Easter ends the long Lenten fast, my wife observed the fast following a vegan diet for the forty days before Easter. In the last week she also omitted any oil from her diet and on Good Friday (here Red Friday) she had just bread and water. I followed the Georgian fasts in my first year but have since been less strict about what I eat. 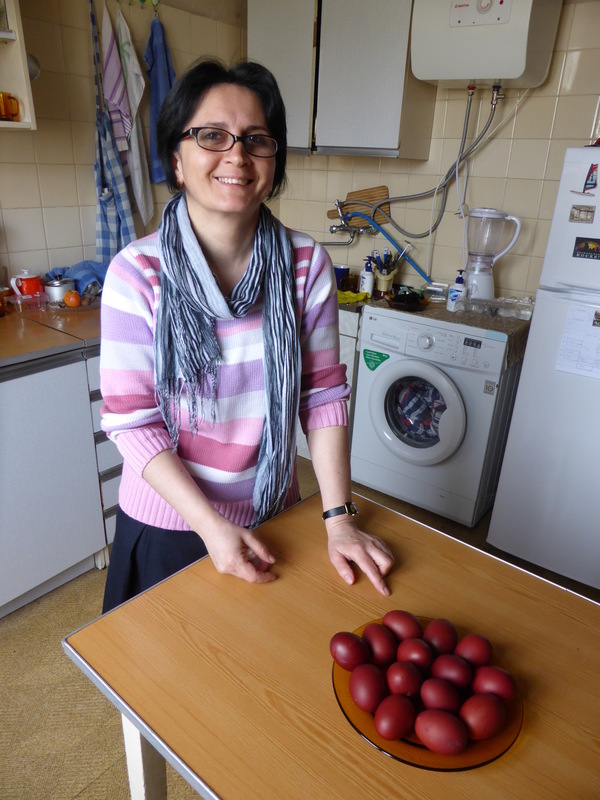 Khato with the eggs she has dyed. 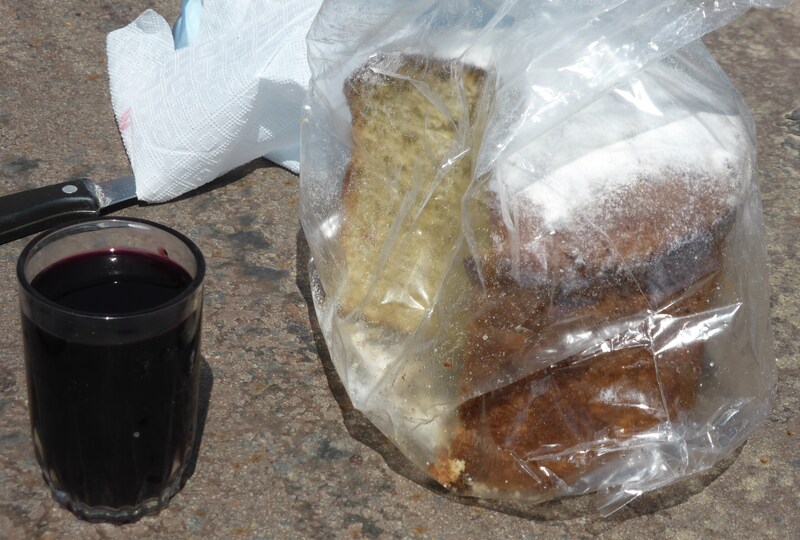 It is the practise here to dye eggs red on Good “Red” Friday, to be eaten on Easter Day with special Easter cake. I notice one of the blogs I follow, covered the Pope’s Easter Message, this Pope has a pertinent message in these troubled times. I was given a book at the TICF service, looks interesting.